There he stood on the crowded sidewalk proudly wearing his not-so-cool sandwich board sign. He was handing out pamphlets and shouting at the top of his voice, "Repent!! Avoid Hell! Repent!" I happened to be in New York City when I saw this fellow, but I'm sure many of you could describe a similar scene. I applaud his boldness, I think. But, my heart sank because, well . . . The approach is, without argument, lacking in too many ways to list. I could never imagine. But, repentance? He was right about that at least. It is certainly necessary for unbelievers and also for believers. So far we've talked humility and honesty; this week we worked through repentance. Notice the progression because it isn't accidental or inconsequential. A couple of things landed on my heart this week as weighty reminders as I studied repentance. Are you ready? 1. As followers of Jesus, a repentant heart is crucial to our daily lives. Until Heaven, we are susceptible to sin. We cannot deny that reality. Likewise, we cannot escape taking responsibility for our sin. And you guessed it! Humility and honesty are required. I've been asking the Lord to help me respond quickly to the voice of the Holy Spirit when He reveals sin in my life. 2. Repentance is more than a confession. True repentance requires the laying down of something and a refusal to pick it back up. The study explained the Greek word translated repentance means that our minds change or we think differently about something. Do you know what that means? It means a change of behavior follows repentance. I'm not saying we get it 100% right every time after, but there is definite, measurable movement in a new direction. It means obedience in whatever the Lord is asking of us in a particular situation. Here's the thing: our hearts and minds are limited; there is a finite amount of space for things to settle. How often do sinful attitudes and behaviors move in and make themselves at home? Repentance, in it's truest form, means clearing out space for the Lord to fill. And, through grace and the Holy Spirit at work in us, He fills us with godly character so that we are beautiful reflections of Jesus. Isn't that what we all want? It's absolutely what I want. But, on my own, it's impossible. I need Him. So, I do not want any unconfessed sin or an unrepentant heart to keep me from Him. What's something you need to confess? Is the Holy Spirit calling you to repentance in any area of your life? May I encourage you today, sweet friends? Don't delay. 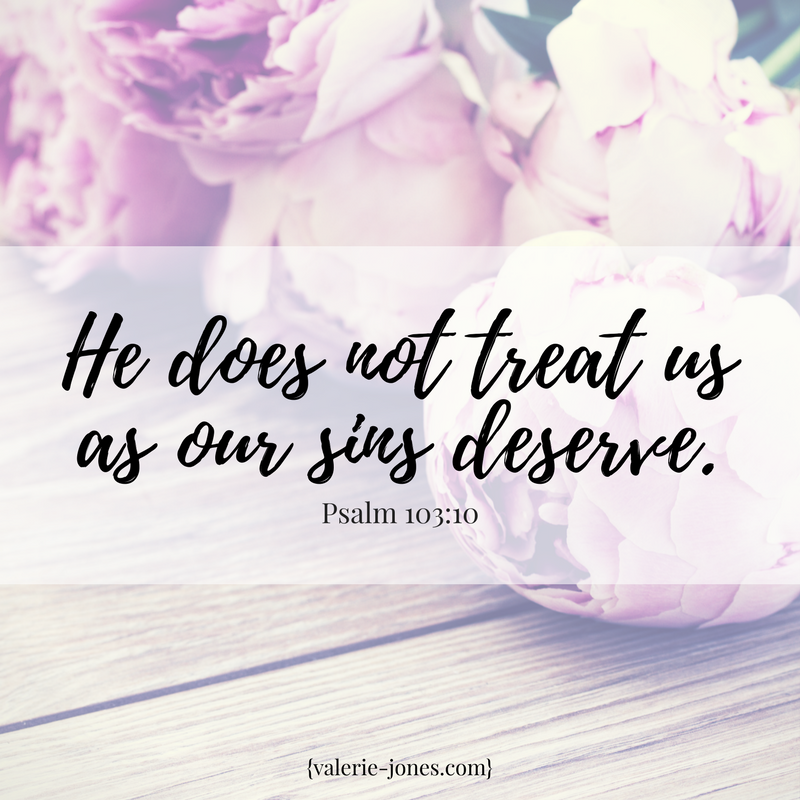 He is faithful to extend forgiveness, and "he does not treat us as our sins deserve or repay us according to our iniquities." Because, love. Because, grace. Because, Jesus.